When we woke up on the plane, it was light outside and we were somewhere over land - probably Ireland or Scotland, we weren't sure because the plane maps weren't working. It was sunny outside, which was unexpected anywhere around Great Britain. We got a small croissant for breakfast, and touched down not too much later. It was about 8:30 am, about 30 minutes early, which was nice since we had a tight connection that Justin had been fretting. Unfortunately, we lost most of those 30 minutes because we didn't have a gate - we had a parking spot and then buses to the terminal. In the terminal, we went through security in relatively short order, although since we were scheduled to depart at 10:45 and our ticket said that the gate closed at 10:25, we were nonetheless fretting. After clearing security, we had to take a tram over to the C Gates (Terminal 5 at Heathrow has A, B, and C gates that are connected by a tram, similar to what is done in Atlanta and Denver). At the C gate, we briskly walked over to our gate, C61, only to be shocked. Even though it was right at an hour before the departure time, and only 40 minutes before the gates were to close, we were literally the only people there. 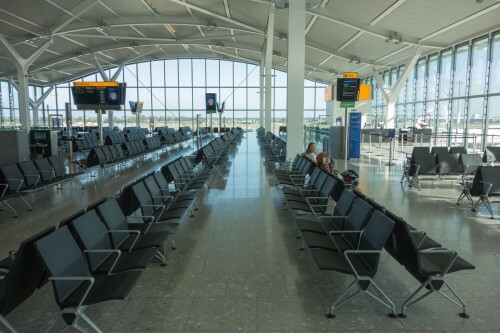 No tourists, no cleaning people, no gate agents, nothing. It was so empty we were worried the flight had been cancelled or delayed or something similar. But slowly, people started showing up, and when a gate agent showed up around 10 we started to feel better. Even though we had our pick of hundreds of seats, we nonetheless stood, because we had been sitting for long enough and knew we had another long flight in front of us. On the plane, we had window seats this time (we were in the center on the IAD-LHR flight), and the view out the window was nice because of the good weather. We headed out over France/Belgium, then down over Luxembourg and the Swiss Alps, then the Alps came to an abrupt end in northern Italy, not too long before we reached Venice (it was on the other side of the plane from us) and the Adriatic. We hugged the Croatian coast for awhile before heading in over the former Yugoslavian republics, Albania and Greece. When we passed over the Mediterranean and reached Northern Africa, we thought we were in the homestretch. Nope. The Sahara desert is really really really big. We had been over it for hours when Justin turned on the flight map (it was working this time) and realized we weren't even to Khartoum yet. So we killed the hours watching movies, listening to music, and reading books. Crystal watched Side Effects ("it was alright"), Justin watched Olympus Has Fallen ("Die Hard, but with the White House instead of Nakatomi Plaza"). Justin was reading The Fate of Africa: A History of the Continent Since Independence, which was useful for reading up on some history of the places we were going to visit, but also seemed as thought it could have been current events instead of history. The first several chapters of the book discussed, amongst other things, how in Egypt's early days it fought off numerous factions including the Muslim Brotherhood, how the Democratic Republic of the Congo was full of tribal infighting, especially in East Congo near Rwanda and Burundi, and how Rwanda and Burundi had major infighting and battles between the Tutsis and the Hutus that constantly bordered on Civil War. These events were from the late 50s and early 60s, but easily could have been in the exact same places 50 years later, i.e., today. The plane was nice (a relatively new 777 with USB chargers, a nice TV screen, lots of entertainment options, etc. ), but it must be noted that it has the dumbest armrests ever. They don't lift all the way up. They don't even lift most of the way up. They come about halfway up, about 45 degrees from either vertical or horizontal, making them absolutely useless for sliding across seats. So even if you could otherwise slide out of your seat (and leave materials on your tray table), it's impossible. We can't fathom what the purpose of that is. Moreover, why even let them come up at all if they can't come up most of the way? At least then it wouldn't be so infurating. Okay, rant over - nearly 20 hours of flying is driving us mad. 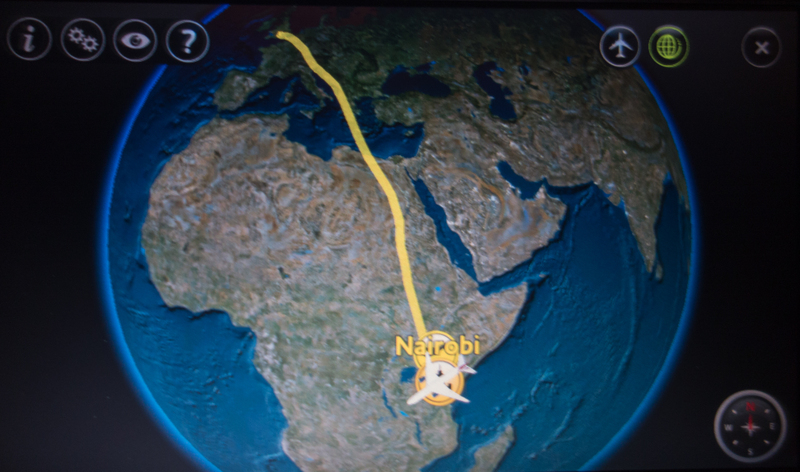 We landed sometime between 9:30 and 10:00 pm in Nairobi. We had been here in 2007 for a couple of transfers, and didn't remember much of anything other than Justin having to leave the secure area with no passport and having to convince security forces with machine guns to let him back in. We knew it would be different this time since a good chunk of the international terminal burned down a few weeks ago. We waited for awhile to get pulled into our parking spot, and even the flight attendant was a little flustered. In the most apologetic and sarcastic (without being overly sarcastic) way, he explained in his British accent what needed to happen, what wasn't happening, and why it wasn't happening. We wish we could remember exactly what he said verbatim, as it was epic, but the short story is there was a comedy of errors for no discernable reason and that "there is a lot of activity right around the plane, but nothing seems to be happening." We did finally get off the plane, and through immigration (in a makeshift catering tent), then met our driver Michael just outside the terminal. 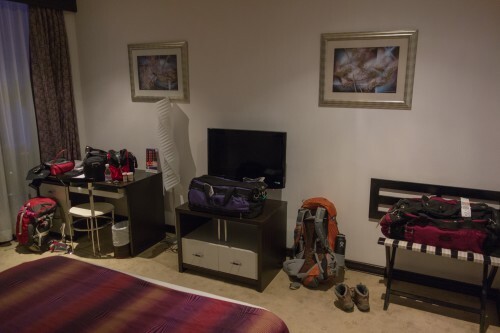 We didn't see much more of Nairobi this time, as it was pitch black and we had only a short drive to our place for the night, the Panari Hotel. We got checked in and were in the room around 11. We quickly crashed, and Crystal fell asleep right away, but Justin couldn't because his feet and toes kept cramping. It was torture, because every time he was about to fall asleep, he cramped up again. He finally fixed the problem by turning around and putting his feet against the headboard so he could push against the headboard whenever he was about to cramp.